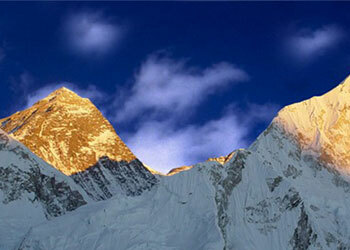 Everest Base Camp short trek is specially designed for those who have limited leisure time. The Trek includes the cultural and traditional lifestyle of the legendary Sherpa’s, surreal view of majestic mountains, rich biodiversity and so forth. Without having any difficulties, the short trek EBC gives the trekkers full opportunity to view the World’s highest peak “Mt. Everest”. The Everest Base Camp short trek starts from the flight to Lukla airport from Kathmandu trek up to Phakding and to Namche Bazar where we will be greeted by many local Sherpa’s with their unique culture. The chance to view the mountain vistas will take your breath away for some time. We then head towards Thyangboche Monastery. The monastery on a top ridge with a fantastic 360-degree landscape, definitely a captivating one and the panoramic view of Everest. After, we will move toward Imja Khola and the village of Pangboche and Pheriche. Similarly, during this Trek, we will be capturing all the places in the vicinity, from Dudh Koshi to the whole Khumbu valley. The amazing lifestyle, delicious food and the culture in there will make your short trek remarkable. Everest Base Camp short trek gives enjoyment with the view of Everest Himalayan chain of Khumbu area that includes five of the World’s Highest Himalaya Mt. Everest (8,848m), Mt, Makalu (eight,463m), Mt, Cho Oyo (8153m), Mt. Lhotse (8,501m) and Mt. Lhotse Shar (eight,393m). Far from the crowded city, this Trek will let you experience the most wonderful time of your life. The nature itself with lots of flora and fauna, glaciers, mountains view, friendly people with distinct culture and ethnicity, monasteries, etc are the key factor of this trek. Above the Himalaya brings you the short Trek to Everest Base Camp with unlimited fun, enjoyable memories and a remarkable trip. With the professional guides and porters, we ensure you the best trip of your life. Trip Snippets:12 days, 11 nights in Lodges, Breakfast lunch and dinner are included during the trek. Your trek Back pack/duffle bag: Your baggage on trek will be carried by our porters, the maximum weight per trekkers is 15 kg including your sleeping bag and down jacket, Other items not required on trek can be stored in our office or your hotel in Kathmandu. Early morning we fly from Kathmandu to Lukla via mountain flight of about 40 minutes scenic flight. With clear weather, we get spectacular views of the mountains, including Everest as we enter the deep gorge of the Dudh Kosi valley. You begin your trek from Lukla, along the way you will have a view of Mt Nupla (5885m), Kusum Kanguru (6367m) and Kwongde Range. We then take an easy walk for about two hours to Phakding village for the overnight stop and rest of the time stroll around the village for local knowledge. The trail follows the Dudh Koshi valley north, meandering through the pines, crossing it twice by small suspension bridges before reaching the village of Monjo the entrance gate of the Sagarmatha National Park. Beginning with a slight climb to Jhorsalle, the trail passes waterfalls and other culturally and naturally occurring items of interest. You will be rewarded with your first glimpse of Kusum Kanguru (6369m) Thamserku (6608m), Everest (8848m) and Nuptse (7879 m). A steep climb up to the beautiful village of Namche Bazaar (3440m) will afford you further spectacular views and a comfortable place to spend the second night of the trek. Set in a natural amphitheater looking across to the jagged ridge of Kongdi Ri(6187m), Namche Bazaar is one of the most attractive settlements in the Khumbu region. We will have a full day rest so that we won’t face any problem ahead. Today we make a short acclimatization trek up to Khumjung, a delightful Sherpa village above Namche. You have full day leisure for wonderful panoramic view or stroll around the market You can also enjoy the splendid views of Everest, Ama Dablam, Thamserku, Nuptse, Lhotse, Tawche, and Kwangde and so on. We start our trek with a pleasant walk through the forest with the magnificent view of mountains. We follow a spectacular path that traverses around the hillside high above the Dudh Kosi River. After walking for one hour you will arrive at Phungithanga. The trail climbs past some water-powered prayer wheels and begins a sustained climb through a forest of tall, mature rhododendrons. Look out for musk deer and Himalayan tahr among the trees. The start of the Tengboche (3870m), the village is scattered across a wide, grassy saddle below a crescent-shaped ridge covered by scrub pines and firs. From the viewpoint at the top of the hill, there are awe-inspiring views of distinctive peaks like Amadablam (6856m), standing proud of the massif containing Everest (8848m), Nuptse (7861m), Lhotse (8501m) and inspiring views of Himalayan giants. We visit the Buddhist Monastery at Tengboche, the largest in the Khumbu region. In the morning views of mountain and monasteries are spectacular in Tengboche. From Tengboche, we head north and soon cross the Dudh Kosi river by way of a small suspension bridge which spans a deep chasm in the river valley. Follow the trail as far as Orsho and take the lower path along the west bank of the Imja Khola, through the forest of birches conifers and rhododendrons. As we follow the river northward the trails pass through several chortens and mani walls and small villages. Today’s walk offers views of the Mt.Tawache, Ama Dablam and to the north-Pokalde (5741m), Kongma-Tse (5820m) and the great wall of Nuptse. Dingboche is also the gateway to Chukung and farther beyond for the most challenging traverses towards Makalu area. We enjoy the beautiful array of fields enclosed by stone walls to protect the barley, buckwheat, and potatoes. Overnight stay in Dingboche. It is very important to spend an additional night here to aid in the acclimatization process. It can be along a short hike 400 m climb to the Nangkartshang Gompa on the ridge north of Dingboche. Good view of Makalu (8463 m) from here. You can go for a day walk like a trek to Chhukung (4,730m) is worthwhile which takes approx. 4/5 hours from Dingboche but it might ruin your rest. To the north of Dingboche, there are spectacular views of Lhotse’s huge South Face. The trail follows a downward path to Pheriche village. It joins the trail below Thungla beautiful views of Cholatse across the valley. After another steep ascends the trail climbs up and over the terminal moraine of Khumbu glacier. Today’s walk offers views of the Mt.Tawache, Ama Dablam and to the north-Pokalde (5741m), Kongma-Tse (5820m) and the great wall of Nuptse. The path follows a pleasant, grassy valley. Stark and rugged beauty create almost moonscape campsite at Lobuche a windswept collection of huts tucked in a narrow meadow between the glacier and the Lobuche peak. Tawoche and Nuptse are particularly spectacularly from Lobuche towering. Stay overnight at lodge. 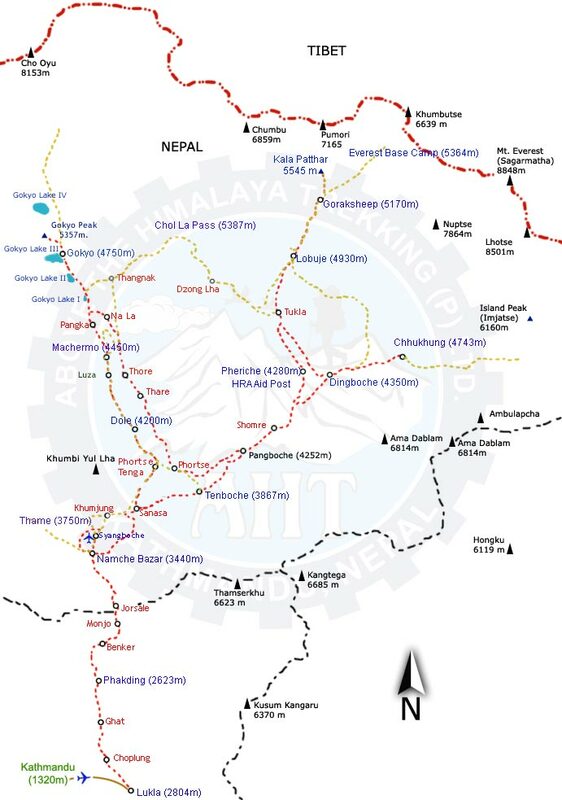 After lunch, our adventure continues towards Everest Base Camp Distance 3.5 km one way. The trail passes through over rocky dunes and moraine and streams. The Base Camp area provides an opportunity to experience the freezing and harsh conditions that mountaineers brave to summit this famous mountain. In Everest Base Camp the climbers gather for summiting Everest during the high expedition season. We explore base camp and its surroundings glacier and return back to Gorakshep. Mornings are usually sparkling and clear and this is the best time to climb the Kalapathar ( about 2 km one way) for one of the world’s definitive mountain views. We will be rewarded the 360-degree dramatic panoramic views of Mt Everest and surrounding mountains like Mt. Pumori, Mt. Lingtren, Mt. Khumbetse, Mt. Nuptse, Mt. Lhotse, Mt. Ama Dablam, Mt. Thamserku along with many other peaks. After crossing the suspension bridge over the Dudh Koshi River trek onwards to the Kyanjuma the junction of the trinity ways to Gokyo Valley, Khumjung village, and Namche Bazaar. Dense wildlife of some species of Pheasants, Himalayan Griffons, Musk deer and wild goat can be found abundance inside the rhododendron forest. In the Evening, we will explore the small surrounding area with magnificent scenery. The descent from Namche to the Dudh Koshi can be the hardest stage of the entire trek. Although the path is all downhill, the unrelenting slope places massive impact on the knees. Once you cross the high suspension bridge, the path runs mostly level. We will work through rhododendron and pine forests with the view of distance snow covered peak before arriving Phakding. Enjoying the lush green scenery around and passing through the incredible mountain scenery and local Sherpa village arrival in Lukla. You’ll have time to stroll around the local areas. Saying a final goodbye to our porters, we will have a flight back to Kathmandu of an exciting one hour, we will drop off to your hotel. Airport / Hotel / Airport transfers by private vehicle for Lukla flight.